I got a direct message through twitter asking about a Brandi Carlile song called “The Eye” (thanks Helen!). 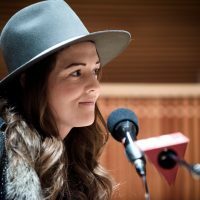 While I’ve listened to Brandi Carlile since her first album, I now realize I haven’t mentioned any of her songs on the site, so now’s the time! “The Eye” is a cautionary tale that doesn’t really come off as giving advice. The speaker focuses on how they’ll deal with whatever the outcome might be. The power of the song is in the allusion to the eye of a hurricane and it being the quiet spot in the middle of a storm. Yes, it’s someplace you can dance, i.e., be who you are when you throw caution to the wind (sorry for the pun), but it’s brief, so be careful long term. I’ve talked about using allusion, a form of figurative language, to create texture in a song. Interestingly, this one utilizes a common weather event that has a signature element to it to emphasize the song’s core message or intent. So how does Brandi Carlile use the weather to talk about an emotional tipping point? This song is all about the figurative language. It’s the key element that works to create the songwriter’s intent, or message, in the song. Without it, the song could possibly come off as preachy or a judgemental. Instead, the lyric has a “yes, you can continue to do that, but it has consequences” sort of tone. More like a friend having a conversation with a friend. But, notice that there is not a constant reference to storms, wind blowing or other hurricane events. The songwriters stay away from embedding the allusion into every verse of the song. In this instance, it’s a prudent choice. Why? Because the hurricane reference is an allusion – not a metaphor. The songwriters aren’t trying to frame everything within the context of how hurricanes happen, the destruction they cause, or a larger meaning. They’re very simply and eloquently using the eye of a hurricane to illustrate the peaceful place that doesn’t exist, for a brief moment. The song also uses the eye of a storm to tie to a girl riding a motorcycle called Hurricane. In this case it is used as a metaphor. The eye symbolizes the “escape” she’s looking for, but follow a sequential story format to deliver on the final escape. Same imagery and reference, but a very different use and execution. Since we’re talking figurative language, you might be asking, why a simile in the first line of the chorus that has nothing to do with a hurricane? Besides the benefit of staying away from too much weather imagery, there’s not really a weather event within a hurricane that fits what the songwriters are trying to say. Being wrapped in a chain has a specific and immediate feeling for the listener: trapped, heavy, cumbersome – bound. The songwriters chose the right image for the intent of the line. What if they hadn’t used the simile (something to ask yourself as you’re writing)? If the almost daunting weight does not come across in the first line of the chorus, the remaining lines have nothing to reflect against. You would not have the sense that the speaker is having a direct conversation with someone, but, won’t give up on them despite the weight. As a result, a great simile choice. Using close rhyme rather than perfect rhyme allows for variety, clever twists and gives you some run way when it comes to imagery and message. In this song, notice how close rhyme starts to overtake the rhyme pattern of the song. The rhyme pattern is a five line verse composed of a couplet and tercet (A|A – B|B|B), then switches to a staggered four line pattern (C|D|C|D) in the chorus. This is a pretty standard contrast technique to make sure there’s some difference between the verse and chorus to the ear lyrically. Same five line verse with a couplet and a tercet, but the last three lines have a close rhyme tied to the [C] rhyme of the chorus using the long “A” vowel sound and a rhyme family match (m replaces n, then replaced by d). Then, notice the final verse – all [C] rhymes! Even more linking. Using the close rhyme to build as the song progresses creates a pace within the song. You hear the rhyme and go to the next, it’s an easy listen and it propels your through the lyric. Your focus also becomes the lyric because in some cases you can almost complete the rhyme before it happens. A poetic form called a quintanelle has a similar five line rhyming structure. The five lines allow for the first two rhymed lines to create a statement or concept, with the three remaining lines in the stanza to give a perspective on the first two. The linked rhyming pattern helps the listener follow the poem’s ideas. The chorus’s four lines rhymed C|D|C|D mimic a quatrain often found in a sonnet. Part of the power of this song is the spare vocals and simple accompaniment. By limiting the production, the attention turns to the lyrics. The structure itself is also spare: Verse, Chorus, Verse, Chorus, Verse, Chorus. No bridge, no instrumental break jumping in there to fill space or sound like someone did their production job. It’s a simple four chord song that uses Travis picking help give it dynamics that don’t overwhelm the lyrics. The vocal harmonies also help bring a lushness to the song, which in turn provides an overall sense of reflection and little bit of remorse to the emotion of the song. I love the fact that the last verse is four lines. Not five like the rest, which would get you a big NO CAN DO at most songwriting meetings. The brevity in this song is important because the last verse is a declaration. It’s clear the speaker is imparting their last bit of help to the “you” in the song. And in keeping with the statement “form follows function,” functionally illustrates that by cutting a line from the form. Cover Stories is her newest project to benefit children affected by war. You’ll find songs by The Indigo Girls, Dolly Parton, Adele, Kris Kristofferson and more. They’ve all agreed to donate the proceeds to the cause. Be sure you check it out!